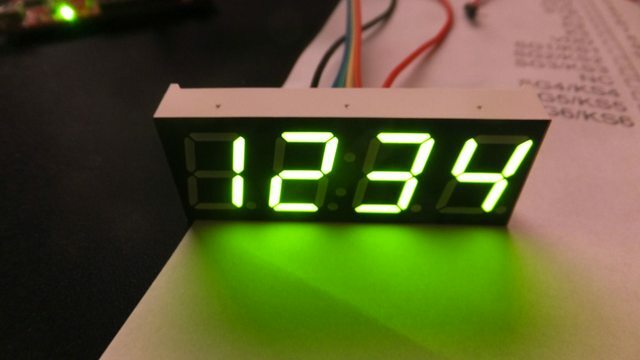 I picked up some cheap 4 digit 7 segment displays over on eBay for $10 + shipping. 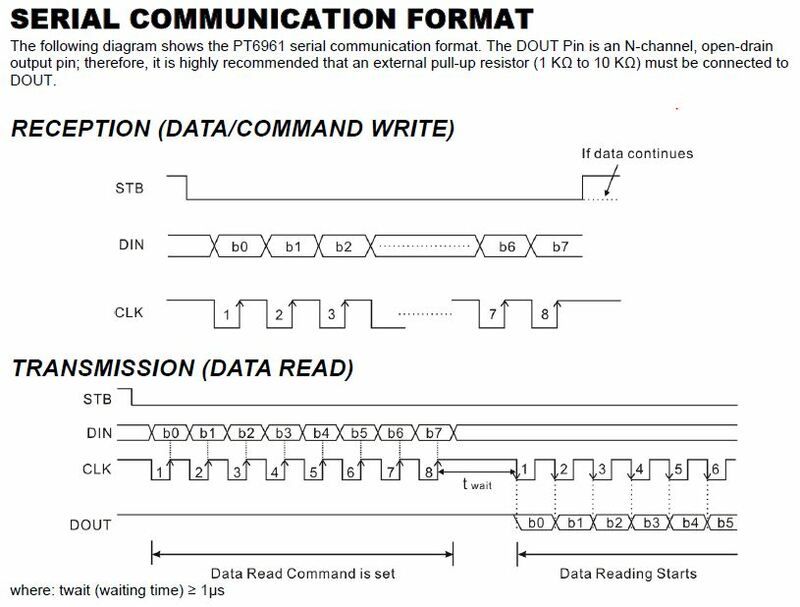 They Include a SPI PT6961 driver chip built in that deals with PWM and Multiplexing, saves on microcontroller ports & current limiting resistors. Figured someone here may have a use for them! What pin is the STB pin? is that CS on the BusPirate? I have the ground/clock/vcc pins connected, where do the other pins get plugged into this thing? Pin out is as follows, starting from the pin closest to PIN1 on the SOP32 chip. VCC, STB, CLK, DIN, DOUT, GND. Right now I don't see any lit segments... Am I just doing something completely stupid here? Idle high is correct, but you need to keep STB low between when you send the address command (0xc0) and when you write to the ram (0x8f). I bet the buspirate is raising the STB after it sends 0xc0. .. DO you have an example of what I could try sending to light up "something/anything" to know if I'm on the right track? I'm kinda supprised no one has any examples for this yet. I have not looked at the datasheet though. Aaron - Did you try turning on the power by using the W command after entering SPI mode? Ian - If you don't mind can you take a look at the datasheet for PT6961? I have posted just the timing diagram for your reference. Any help about SPI setup for this device is greatly appreciated. Yes I have the power on :O haha... reminds me of "The IT Crowd"
You should see 0 displayed on the LED Display. Last edited by rajabalu on Wed Sep 26, 2012 7:41 pm, edited 1 time in total. What's the deal with the last part? the comma? in the syntax? Aaron - The braces '[' and ']' need to be present for each command. We tried to do it all together like [0x02,0x40,0x8F,0xC0,0x3F] before. The correct call is [0x02][0x40][0x8F][0xC0,0x3F]. Comma is to hold the STB at the same level and send the next piece of information. Very cool very cool.. Thank you! So I ended up buying 30 of these things is there an easy way to chain them together? in a week or so I'll have a total of 5 of those 16 char displays. 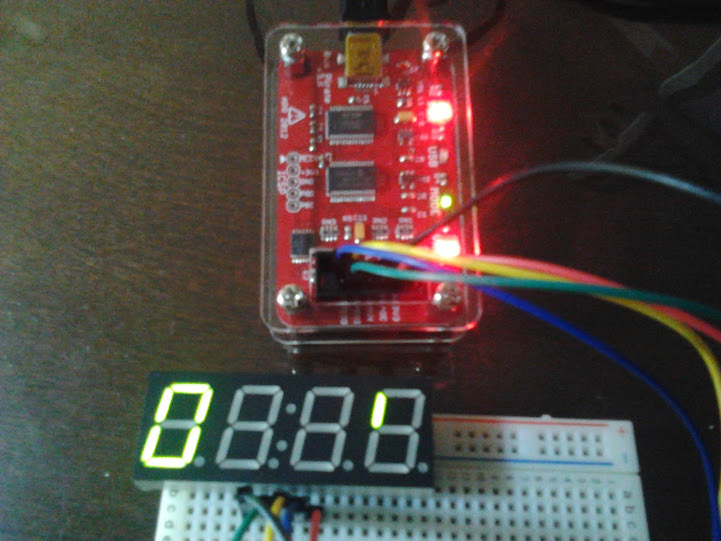 While we could use the CS/STB line to control the LED display of our choice, I am thinking simple daisy chaining the first display to the second will work. We need to try connecting the DOUT of the first display to the DIN of the second display and so on.. CLK, CS/STB, VCC and GND can be connected in parallel. I am just guessing here that daisy chaining will work but I am not sure. I will try it out tonight and let you know. Or I need to bring my LaunchPad out to try this chaining effect. Writing a small program in Energia can loop through the data we need to push out (now that we know what commands to type from our Bus Pirate experiments). I am surprised that you have 30 of these. So the chain will be a long one I suppose. :) What do you plan on using them for? Since they do not have the decimal point connected, I am not sure whether I could make good use of these. I got 10 of them as they were sold as one lot. I am thinking of making a small clock for my daughter and she has a Lego enclosure ready for the display now. The rest of the displays, I am planing to use them as for displaying voltage, current and for a frequency counter. For me the segments are in green but the colons are in red and so they look funny.